Three of the small bluet species that occur in Arizona are the Arroyo, Familiar, and Tule Bluets. The Arroyo andFamiliar Bluets are widespread throughout the state and can be common or abundant. The Tule Bluet is found mostly in the eastern and northern parts of the state (Paulson 2009). 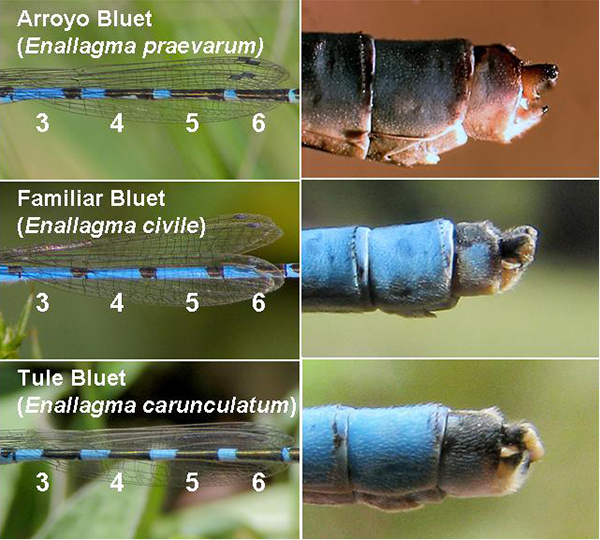 The Arroyo Bluet is, on average, slightly smaller (average length: 30.5 mm) than the other two species (average length: 32.5 mm; Abbott 2005), but there is much overlap. To separate mature males of the three species, focus on the color of the abdomen (especially segments 3-6) and the shape of appendages. Arroyo Bluet: segment 3: only black apical spot, or black apical spot with thin apical torpedo-shaped black stripe extending up to 75% of the segment length. Segments 4 and 6: As segment 3, but black stripe becomes gradually wider and longer. Familiar Bluet: black on segments 3-5 often limited to black apical spot; spot size and extent tend to increase on posterior segments. Tule Bluet: segments 3-6 have large black apical mark that extends > 50% the length of each segment. Lateral views of the middle abdominal segments and appendages of male Arroyo, Familiar, and Tule Bluets, AZ.